Hello my lovely friends! Hope you are all well. Happy Holidays! While I was in New Jersey visiting my family, my brother insisted on me making him a dish. 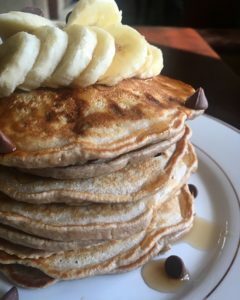 I know he loves pancakes and chocolate chips so I made sure to whip him up some delicious fluffy pancakes before heading back to Chicago. He loved it! 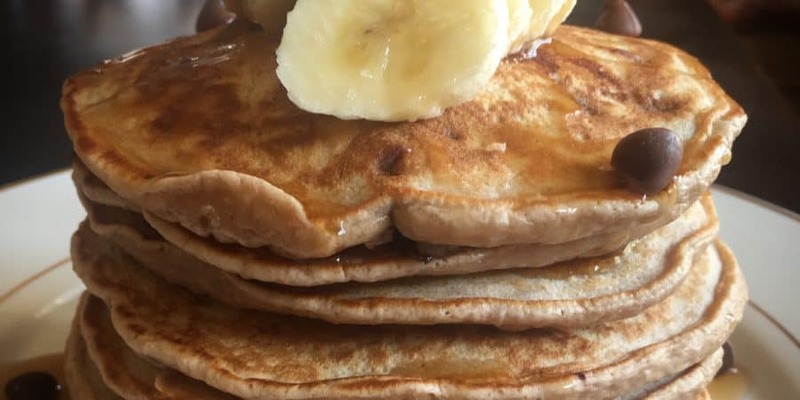 I then knew, I had to share the recipe with you all for these easy yummy pancakes so you can make it for your family as well. Total Time: 1 hr 30 min including prep. Mix the sugar, flour, salt, baking powder, and cocoa powder together. In another bowl, mix the milk and egg along with vanilla extract. Pour the wet ingredients into the dry mixture. Mix gently till no lumps. Then add the chocolate chips and gently stir that in. Allow the batter to sit for 30 minutes-45 minutes in the fridge. Using cooking spray, spray the pan lightly and add just enough batter to make a perfect sized pancake. Allow to cook on each side about 3 minutes till lightly brown on medium heat. Keep repeating the same process. Enjoy with some syrup and fresh fruit!